One of the most talked about and overcomplicated aspects in the fitness industry. Abs. Core. Midsection. Burning belly fat. I don’t know about you, but when I do my research, I use Google quite a bit. And I still remember the days of typing into the search engine “how to I get a six pack”… Only to be disappointed by what came up. The truth is… Burning belly fat and getting super strong abs is not as complicated as the fitness industry makes it out to be. But if you have the right plan in place, it’s possible for anyone. That’s why over the next 3-days, we’ll be covering some of my best training and nutrition tips when it comes to getting a super strong and lean midsection. 1. You’re still doing crunches and sit ups everyday. These are fine here and there, but they should NOT be your focus. There are far more superior exercises that you should be doing instead. 2. You still think it’s ALL about the kitchen. Yes, diet of course plays a big role in the results you see. We’ll dive more into that in the next few days. But without proper training, you won’t get the results you want. The proper workouts are a must. Relying on diet alone won’t fully get you there. => Here’s the ab workouts I’ve been using lately that I’m very pleased with. 3. You’re still slaving away on the slow cardio. You simply won’t burn the calories needed to get rid of your belly fat with this kind of training. => Here’s the 20 ab workouts I’ve been using that not only build a super strong core but burn a ton of calories too! 4. You’re still blaming your genetics. The truth is, no matter what your genetics are… Six pack abs ARE possible. I know this because I’ve seen it all. “Slow metabolism”, “big boned”, “gain fat easily”… Doesn’t matter, it’s possible for you. Often times, you’ve first just gotta BELIEVE before anything else. Believe it’s possible, then make it happen. SUPER STRONG AND LEAN CORE! Hey, I'm Dennis Heenan, the guy behind this website. The Superhuman Life is centered around ways to Be Extraordinary through simple tips, tricks, and Lifehacks. I'm a "tester" by nature and love trying new things so that I can help others. Feel free to email me anytime! 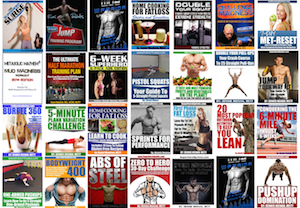 11 Authors, 28 Programs, 1 INSANE DEAL! CLICK HERE TO LEARN MORE!